It has been a busy year, Daniele and I married in June and then moved in September. The routine of daily life has finally returned and I am once again tackling my ever moving goal of catching up with photos and trip writeups. Starting with our honeymoon. After the wedding on the first, the breakfast on the second, clean-up on the third (while Daniele took his father and uncle to NYC), we left for home (Rome) the night of the forth, arrived the morning of the fifth which we used for unpacking/repacking, then left for our honeymoon in Greece on the sixth. 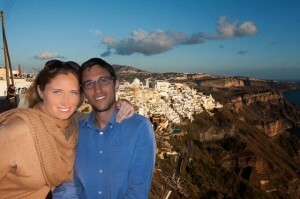 We spent the nine days of our honeymoon (June sixth to 14th) in Santorini, Greece, grazie to my now inlaws. Because June is apparently low season in Greece, there were no direct flights from Rome to Santorini, like there are in July and August. We had to stop in Athens both ways. On the way there we had such a long layover that we ended up with a day in Athens. Not enough time to really do anything, but we did get to walk around and see a bit of the city. 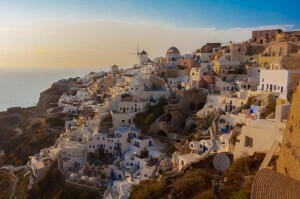 We chose Santorini because it is supposedly one of the most beautiful places in the world. Also June, while a lovely time of year in the Northeast United States and in Italy, is not a nice time to go to most tropical climates, like the Caribbean or south-east Asia. Additionally, Daniele only gets so much vacation time and he spent most of it doing yard work at my parent’s house before the big day, so we had a short honeymoon, by Italian standards anyway, and we didn’t want to loose too much of our remaining time in transit. Santorini is a crescent-shaped island formed by a volcanic explosion. It is famous for the views of the giant lagoon in the middle. Because it is a volcanic island, most of the beaches are black sand and different from the more tropical islands in Greece, but the beauty of the island itself makes up for the lack of powdery white sand and the water is just as beautiful. We stayed in a beach-front resort. While our typical vacations are more sight-seeing-packed, I really wanted a relaxing, sit-still honeymoon. Which was good foresight because I was pretty destroyed by the time the wedding actually happened. Our package included breakfast and dinner (so we didn’t even have to worry about deciding where to eat every night, a big time-saver when traveling with Daniele). Looking back at our pictures and remembering this trip, my tummy has been grumbling thinking of all the delicious food we stuffed ourselves with everyday there. We also rented a motorbike to get around the island. In the end, our resort beach was actually my favorite, but we still wanted to see the famous Red Beach, White Beach, and some other reportedly beautiful beaches, as well as all the little cities. Link to pictures below. I wont repeat every place we saw now, since I have it on the photo captions. Also, be warned there are some sappy kiss-y photos mixed in with all the sweeping panoramas. I just want to tell you that I am beginner to blogging and site-building and definitely liked your blog site. Likely I’m going to bookmark your blog post . You certainly come with impressive stories. Cheers for revealing your webpage. After I initially commented I seem to have clicked on the -Notify me when new comments are added- checkbox and now every time a comment is added I get four emails with the same comment. There has to be an easy method you are able to remove me from that service? Thank you! We merely desire to show you the fact that I’m really raw to online blogging and clearly liked your write-up. Probably I am prone to store your blog post . You really have impressive article content. Be Thankful For it for share-out with us your domain information. hello there and thank you for your info – I’ve definitely picked up something new from right here. I did however expertise some technical points using this site, as I experienced to reload the website lots of times previous to I could get it to load properly. I had been wondering if your web host is OK? Not that I’m complaining, but slow loading instances times will sometimes affect your placement in google and can damage your high quality score if advertising and marketing with Adwords. Anyway I’m adding this RSS to my e-mail and can look out for much more of your respective intriguing content. Make sure you update this again very soon.. Pretty motivating suggestions you have remarked, thank you for adding.